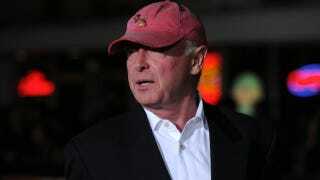 Tony Scott, the director of such beloved classics as Top Gun and Days of Thunder, was found dead today after jumping off the Vincent Thomas Bridge in San Pedro earlier this afternoon, an apparent suicide. Investigators found a note, which was left in his Prius on the bridge. Scott, aged 68, is famous for making numerous action films, dramas, and the action comedy Beverly Hills Cop II. He's also the brother of director Ridley Scott. What prompted Scott to take his life is unclear, but he leaves a large body of work behind including Crimson Tide, Enemy of the State, and True Romance (full filmography here).